The Port of Vancouver Delta Community Office provides an opportunity for the community to meet Vancouver Fraser Port Authority staff and learn about port operations, initiatives and projects, including the proposed Roberts Bank Terminal 2 Project. 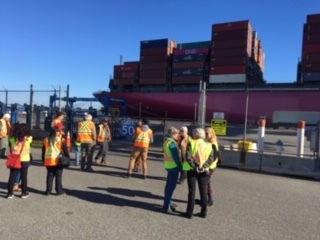 The office is open to the public and hosts a variety of free events such as bus tours and a speaker series, aimed at broadening the public’s understanding of the Port of Vancouver and the Vancouver Fraser Port Authority. The Speaker Series has included guest speakers who have presented on topics such as the Alaska cruise industry, the role of a Fraser River marine pilot, the Canadian Coast Guard, shore power for container ships, and Canada’s grain exports. 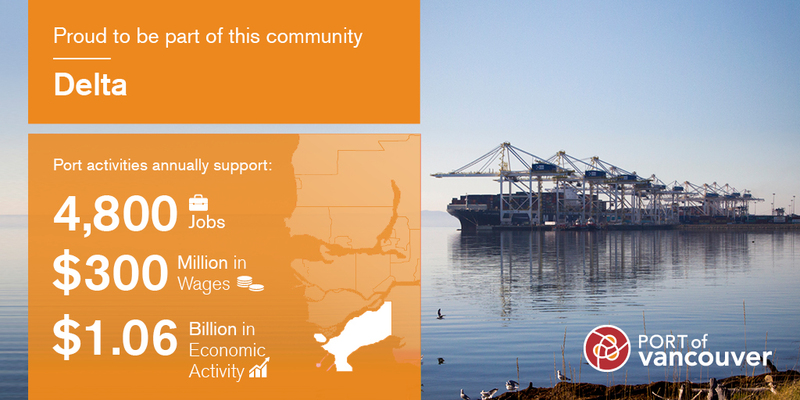 The office also hosts meetings, such as those of the Port Community Liaison Committee. Subscribe to the Delta community office newsletter. Please subscribe to the Delta community office newsletter to receive notification of future tours. We’ve moved! Please note the address of our temporary location until June 2019. Wednesday to Friday, 10:00 a.m. to 6:00 p.m.
For more information, please contact us at 604.665.9635. Deltaport is the Port of Vancouver’s largest container terminal, located at Roberts Bank in Delta. It handles containerized cargo and some project cargo. Operator: Global Container Terminals. Wallenius Wilhelmsen Logistics (WWL) auto terminal is one of two automotive terminals located on the Fraser River. It handles BMW, Honda, Hyundai, Kia, Mercedes Benz, Mitsubishi, Nissan and Subaru. Operator: Wallenius Wilhelmsen Logistics (WWL) Vehicle Services Canada Ltd.
Westshore Terminals is a coal export terminal located at Roberts Bank in Delta. Operator: Westshore Terminals Limited Partnership. Port Community Liaison Committee in Delta discusses developments, identifies concerns and provides suggestions for port-related issues in Delta. The committee includes representatives from industry, the City of Delta, Tsawwassen First Nation and the Vancouver Fraser Port Authority as well as community members from Ladner, Tsawwassen and North Delta.